Scan Holdings is a competitive and leading exporter for Printed and lacquered Tinplate that is used in the manufacturing of metal Cans and Lids/Bottoms for packaging of food, beverage drinks, paint and aerosol. With almost 30 years’ experience in Tinplate/TFS Can & End Making technology, Scan Holdings understands the importance of high-quality tinplate, high lacquer integrity (quality) and precision lithographic with exact colour matching. So many of our customers prefer to directly buy lacquered and printed tinplate/TFS from us and avoid the administrative hassles and cost of first buying tinplate and later sending them to an agency for printing and/or lacquering. For a different type of usage, Scan Holdings can recommend you the right type of tinplate and appropriate lacquer. It can also participate to improve your products visual appeal by making suggestions on lithography. And of course, it can exactly follow and deliver the lacquer and printing specification if the buyer wants no changes. It is Low carbon steel coated with tin having a layer between them of steel-tin alloy and destined to be used mainly in the production of metal cans and lids. Tinplate provides good weldability and electrical conductivity, as well as high corrosion resistance. Tinplate can be supplied in sheets or coils. 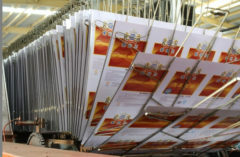 In the case of sheets, we are able to deliver the material lacquered and printed, as well as with straight or scroll cut. The thickness offered by us is from 0.14mm to 0.30mm. We can offer both single reduced (SR) and double reduced (DR) tinplate. The hardness (temper) can be as per customer requirement. Both Batch Annealed (BA) and Continuous Annealed (CA) can be offered. Tin Coating can be same or differential on outside and inside as per client’s requirement. Double reduced (DR) ETP is normally thinner but stronger than conventional Single Reduced (SR) ETP. DR ETP is produced by electrolytic coating of tin on steel, which after an initial cold reduction and annealing is subjected to a second cold reduction with lubrication, which gives work hardening effect and imparts additional strength to Double Reduced material. 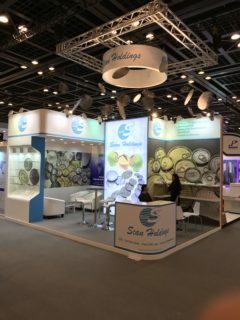 In addition to DR Tinplate, we can also offer Soft Double Reduced Electrolytic Tinplate (Soft DR ETP). Soft DR ETP is Double Reduced material produced with lower second cold reduction as compared to the normal DR ETP with a hardness/temper of 65+4/-3. Soft DR is available in thickness ranging from 0.18 to 0.23 mm. Tinplate (ETP): What we offer – at a glance! Tin Coating Starting from E05 to E100. More common coatings are D2.8/1.12 (D25/10), 2.8/2.8 (E25), 5.6/5.6 (E50), 5.6/2.8 (D 50/25), D 11.2/5.6 (D 100/50). Differential tin coating on inside and outside are offered too. Lacquer Type Epoxy, Polyester, Aluminium suitable for a variety of products like meat, pet food, fish, tomato, vegetables, fruits, Cheese etc. Lacquering can be done in different shades of Gold, Clear/Transparent, White and Buff. Special lacquers offered for Cheese packing. Lithography / Printing Offered with both conventional and UV sheet printing technology. Special effects can be given by using metallic and temperature sensitive inks. Tin Free Steel (TFS): What we offer – at a glance! 1. Competitive Cost. Especially for lacquered and/or printed tinplate and TFS. 2. High Quality of tinplate. 5. Expert recommendation/suggestion using more than 30 years of experience available with us.